Ok..I am taking my vitamins, I am getting enough rest, I am drinking my fluids, meditating, washing my hands, exercising, eating right and I still get sick. Oh, wait a minute…maybe I wasn’t doing all of that to the extent that I usually do. I am a creature of habit and routine and it takes me a bit of time to transition. From an Ayurvedic standpoint, I am described as a VATA type. Although I love Fall, it is one of the most challenging times of the year for me. The drop in light, the temperature change and most dramatically the change in my work and life schedule throws me for a bit of a loop. So, I realized I was skipping some of my morning routine, perhaps not drinking as much water as I should, doing laundry a little later in to the evening and not getting to bed as early as I normally do and therefore getting a little run-down. I guess I should have seen it coming. Hands down, the best way to deal with a bout of the cold/flu is to go to bed ( if you can) for yourself and for everyone around you. Rest is the best way to give the body a chance to heal. I enjoyed a day of the Marilyn Dennis Show, Dr. Oz, and home renovating shows in between naps. Not a bad way to spend the day although I have to say I am now obsessed with The Marilyn Dennis Show! I also took out my Fall Survival Kit ( SAD Light, Diffuser, Neti Pot, Dry Brush) and added the following for a day of immune boosting: Oil of Oregano ( orally and in my diffuser) , Vitamin C, Honey, Ginger, Lemon, Cold B Gone Tea, Turmeric, Coconut Oil and Oscillococcinum ( a homeopathic medicine), and my usual probiotics and apple cider vinegar. I am happy to report that it was the fastest I ever recovered from a sore throat, fever, knock-you-out kind of cold. But it was also the most that I have thrown at cold symptoms at one time. I have to say the one thing that was new for me and was very effective was a 3000 year old Ayurvedic Technique called Oil Pulling. I used coconut oil with no other oil and just for 5-10 minutes. Some lofty claims are made on the internet, but, in a nutshell, it helped to clear out my congestion in conjunction with my sinus rinse, and it made my mouth feel great. I have now added this to my daily routine – http://www.mindbodygreen.com/0-20299/a-mini-guide-to-oil-pulling.html. All of this being said, it might of just been taking a full day to rest that resulted in a speedy recovery but I do love to explore new remedies. If you have any questions about the above, speak to your friendly pharmacy staff, your physician or Doctor of Naturopathic Medicine. Treat yourself well. Breathe, rest and give your body and mind a little time and space to transition into this wonderful Fall Season. If you have a few sweet potatoes leftover from Sherry’s Sweet Potato Soup last week, why not throw them in the toaster? Apparently many people have heard of Sweet Potato Toast but it was news to me. Cathy McLennan ( who credits Frankie Bumstead) shared this gem with me after class last Wednesday. Thank you ladies! We have been having such fun with our recipes and we are so pleased that you are trying them, sharing them and correcting them ( yes, don’t be shy to let us know when we have made some mistakes so we can fix them for you “). Method: Take a medium sweet potato and cut it lengthwise ( give it a good scrub but you can leave skin on). You can put the slices in a toaster ( set on high) and toast to your liking ( a little brown on the outside and tender on the inside). I had to put it down 4 times in the toaster. I also used my toast tongs to take it out ( very handy little things). You could do them in the oven but it is not as much fun. I have included a link below for ideas on different toppings as the sky is the limit. The photo above is one of my favorites ( almond butter and bananas with a sprinkle of cinnamon). Nutrition ( 1 medium sweet potato): 103 calories, 2 g Fat, 2 g Protein, 23 g CHO plus any topping you would like to put on it. One medium sweet potato makes 4-5 slices so it can be divided in to a couple of snack times depending on whether you like them plain or topped up. “The idea of menopause as a deficiency disease is faltering. More and more women are finding beauty in their menopause and claiming themselves as women of wholeness. The menopausal years, the climacteric years, constitute an enormous CHANGE. And change is a challenge. A challenge each woman will meet in her own unique way” Susan Weed, New Menopausal Years The wise woman way. Menopause is often a very confusing time in a women’s life or at least it was in mine. My Menopause was surgically induced, so the day after my surgery my body had changed. I wasn’t prepared for all the changes that would occur over the ensuing 31/2 years. I have to admit that I didn’t love the menopause experience in the beginning. The hot flashes, night sweats, heightened anxiety, sleep disturbances and moodiness were foreign to me and they seemed to all come at once. This was a tuff adjustment for me and those around me. When I started to look around for resources to help navigate this change their were definitely some great books available, and of course lots of stuff to google, but sometimes that just scared me. I had a great Doctor, pelvic health physiotherapist, loving supportive husband (even though his world was turned upside down as well), supportive family, and friends, however I still often felt alone. I had to learn to be compassionate with myself and be prepared to go outside of the box to find ways to help me manage this change. My heightened anxiety and panic attacks opened the door to Yoga for Anxiety and a partnership with Lorrie Mickelson to create this program for the studio, after all I couldn’t be the only one experiencing this. Lorrie and I have offered this program multiple times since its creation and the classes are always full. This summer we got to talking about a Fall Retreat and what we would like to offer. All three of us are at different stages of the menopausal cycle. I am always so grateful for these beautiful women in my life and our ability to co create as well as learn from each other. So what if; we could offer a weekend locally that would inform, educate, nurture, nourish and support you wherever you are on the menopausal journey! I am happy to say that we are doing exactly that at the beautiful Haileybury Presidential Suites on the October 21st weekend. Marie Josee Forget a pelvic health Physiotherapist will be joining us to discuss both pelvic and sexual health changes that occur during the menopausal experience. The weekend will also include interactive cooking experiences with foods that help support menopause, to the Healthy Menopause Survival Kit and lots in between. Of course their is some unwind time to just relax and soak it all in. Nothing like a great chick retreat!! If your interested please let us know by emailing the studio balancedmotionstudio@gmail.com as space is limited. This soup was truly a taste experience. The original recipe called for bacon, which I took out to reduce the saturated fat. Their is still a nice amount of fat and fiber to make you feel satisfied. I batch cook and then put the remainder in mason jars in the fridge. It will last a few days and I have lunches for the week. Enjoy! Add oil, chopped onion, celery and cook until soft, add garlic and saute another minute. Stir in diced sweet potatoes, thyme, & salt. Add broth, partially cover and simmer until sweet potatoes are soft. Puree soup using a blender or immersion blender. Return soup to pot and stir in 1cup of coconut milk, add more pepper if desired. Garnish with fresh parsley. 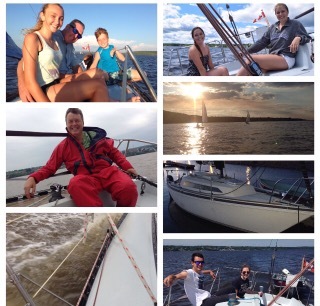 The last two Wednesdays of August were two pretty sketchy days when I had to be convinced to sail. On August 31st the wind was so intense the hull of our boat was virtually perpendicular to the water on one leg of the race. The whole edge of the boat and lifeline was submerged in rushing water. My goal on those days is always protect from bruises. That day I found myself thinking about capsizing. I knew academically we wouldn’t capsize but those times when the deck surface is vertical can make you wonder. It is conditions like that when you really learn an appreciation for the power of the wind and the tension those conditions put on the rigging of the boat as well as your body. Also, in high wind conditions you really learn if you have core stability or not!! Usually it is my job to winch (tighten/loosen) the head sail (front sail) as we tack (change the boat’s direction). I’m always impressed at how much upper back and arm work is required for that job especially as the Captain says “keep coming” while you’re trying to brace your balance and put your whole body into turning the winch an inch more. Luckily on August 31st we had the pleasure of sailing with our son Ben and his friend, both young and strong…so I nominated Ben to be the wincher. But it made me chuckle to see how intense he found the winching and when the Captain said “keep coming” he turned finally and said “that sail’s not coming in any tighter!”. Then there is the actual act of moving about the boat in conditions like those. Picture your floor as a vertical, often wet surface. You are looking for footholds and places to brace yourself plus keeping one hand on the boat at all times. (Note there are no photos from that day!! 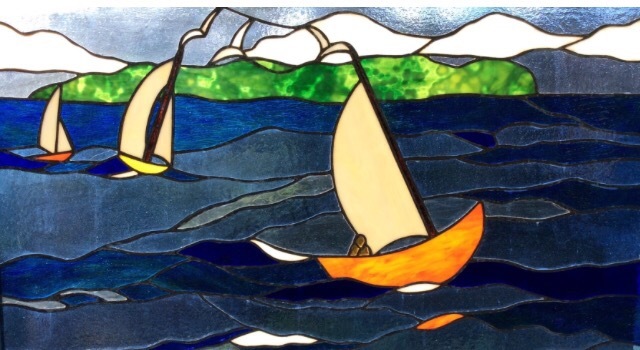 ) In lumpy water the boat is lurching a bit as it handles the waves (especially Lake Temiskaming’s choppy swells). And because you are on a set course you can’t choose the comfortable tack (angle) to point the boat. All of this is keeping your core on high alert. People who have not sailed in stronger winds often seem to think sailing is too slow or boring… I offer that it is the exact opposite of boring and slow! What an adrenaline rush! The trick is finding the niche where you are having a blast but are feeling safe. So today brings the last race night for the 2016 season, sad to say. This summer we’ve had the gamut of conditions for our races. It’s been a stellar season overall, especially that phase of long warm evenings. If you are intrigued to try sail racing please contact me next spring. We’ll find a nice breezy Wednesday for you to join us in a race when the conditions are not so extreme but do ‘blow the cobwebs away’ so to speak and hopefully you will find the sport as fun as we do! All aboard. Upping protein in your fuel helps you feel fuller longer. Goodbye late night snacking. Hello to enjoying delicious fall bounty, butternut squash. Toss chicken with cinnamon and garlic salt. Heat a large non-stick frying pan over medium high. Add oil, then chicken. You may need to do this in two batched. Cook chicken until no pink remains, 5 to 7 minutes. Transfer to a plate. Loosely cover with foil. Add squash. Pour broth into frying pany. Boil, then reduce heat to medium-low. Simmer, covered, stirring occasionally, until squash is tender, 8 to 10 minutes. Add onions during the last minute of cooking. Divide among 4 plates and top with chicken. Nutritional Value: Calories: 216, Fat: 6g, Protein: 19.5g, Fibre: 4.7g, Carbs: 26.1g. As we stopped for a swim at the sandbar on Lady Evelyn this past long weekend, I couldn’t help but be struck by the beauty of the scene. The very blue sky, the clearness of the water, the interesting way the rocks and sand clustered together to form the sandbar. And of course, I had to ask, ” Who wants to do Tree Pose for me on this amazing sandbar? ” Ah…the joys of camping with a Yoga teacher. We all looked at each other and my friend France said, “Amy will do it ” And Amy did and she did an amazing job capturing the essence of Tree Pose. Tree Pose is about balance, strength and focus. We focus our gaze ahead as we stay grounded in our roots, we gently sway with the wind yielding to the pushing and the pulling but we continue to stay grounded. It is truly a pose for this age group ( of late teens) who are starting to venture out in to the world but have the support and strength of their roots. It is also a pose for us parents who need to sometimes remind ourselves that we have given our children both roots and wings and they will be just fine. On that note, good luck to all of you who are sending your kids off to school for the first time whether it is kindergarten or college/university. Stay grounded, breathe and enjoy this transition as we know the kids will. Good luck to Amy in her last year of high school and as she participates in this years Harvest Queen…….another opportunity to reach for the sky! Note: We send all of our positive energy to those property owners on Lady Evelyn who are dealing with the aftermath of a microburst a few weeks ago. People from around Lake Evelyn and neighbouring lakes are helping with the clean up. We are so blessed to live where we live, not only with the beauty of the landscape, but the beauty of the people. These are a perfect way to transition in to Fall baking. I love any recipes that use my zucchini and I just purchased 2 baskets of fresh blueberries which were amazing in this recipe. I also used only a 1/4 cup maple syrup for a little less sweetness and did not have almond extract but play with this to your liking. Enjoy! Preheat oven to 350 degrees F. Line a 12 cup muffin pan with nonstick cooking spray or line with muffin liners or use a silicon pan ( this is what I used in the photo above). In a large bowl combine the dry ingredients: flour, baking soda, cinnamon and salt; set aside. In a separate medium bowl, combine the following wet ingredients:zucchini, maple syrup, vanilla and almond extract, olive oil, applesauce, egg and milk until well combined. Add to dry ingredients and stir until just combined. Gently fold in blueberries. Even distribute batter among muffin tins, filling about 3/4 of the way full. Bake for 19-22 minutes or until toothpick inserted into the middle of the muffin comes out clean. Cool on wire rack for 10 minutes then remove muffins and transfer to wire rack to finish cooling. Makes 12 muffins. Minimum of 10,000 steps per day. In other words take every opportunity to move more. There are 168hrs in a week, if you work out for 3 hrs a week, besides sleep what are you doing with the rest of the hours! Sleep, trying to get 7-9hrs of sleep per night. Lots of research out on the impact of being sleep deprived and its effects on optimum health. Eat a healthy, balanced diet that includes fiber and lean sources of protein, fresh veggies, and heart healthy fats. Unplug for a minimum of 1 hr per day. Shutting off all screens 1hr before bed. Using ap’s like Twilight that start to dim your screen as the day goes on. Resistance training, push or pull something heavy everyday! Great habits to integrate into our daily lives. As fall approaches and we get back into routine, what do you aspire to? If you focus on one of the above and make it a daily habit, you will create positive change in your health! After all your worth it! !